Selecting / Choosing a Good Qualified Roofing Contractor can be a daunting task. And to find three, the recommended minimum number, to obtain proposals from is very difficult. There are many problems when using referral lists or any of the methods listed below. Yellow Pages? Basically a very poor source other than finding a phone number and location. It is like being blindfolded and trying to throw a dart to hit a balloon. Big ads or placement of the ads or how the ad looks or for that matter the content does not mean that Roofing Contractor is better than the one who just has a listing. Online Yellow Pages? This is even worse than the printed version of the Yellow Pages. If you search for Roofing Contractors in your area you will only find the Roofing Contractors that have paid additional fees to be listed. So your field of possible Roofing Contractors is now limited. Flyers left on your door? It is a good way for a roofing contractor to let Consumers know that they exist. But only call them after you have thoroughly checked them out. Contractors knocking on your door? They are mining for jobs. Be careful of this type of sales technique. They might say things like â€œWe have found that roofs in your area have received damage from hail. We can check your roof at no cost to you and then help you get a new roof from your insurance company. If you did not call them, it is best to simply send them on their way and then only call them after you have thoroughly checked them out. Always get proposals from other Roofing Contractors in addition to their proposal. Then you will have something for comparison. How about from an ad in the newspaper, radio, TV, Google, or Yahoo? Same as Flyers. It is a good way for a roofing contractor to let Consumers know that they exist. But again, only call them after you have thoroughly checked them out. Referrals from a friend or an acquaintance? They are a little better especially if it's from someone you know but still leaves a lot to be desired. What can a referral really tell you? Other than: That they did a nice job. The roof looks good. They kept the grounds clean. They were on time. The salesmen was nice, the crews worked hard, etc. Who knows if they really did do a good job or not? What about contractors referred by material supply yards or distributors, or even manufacturer referrals? This might be a little better because you know at least they are paying some of their bills or the material suppliers and manufacturers would not be referring them. However, the major reason the contractors are on their list is because they do business with them. The contractors buy their materials from them and use products manufactured by them. So of course they're going to refer them. The Roofing Contractors that are on almost all Referral Lists / Websites pay big money in Advertising Fees to be there, especially those on Radio and TV personality Referral Lists / Websites. Some might do some rudimentary superficial checking of the contractor's business and maybe the owner's background, or the contractors must agree to some sort of broad vague criteria, but that's about it. Again, there is no way of knowing if your roof is or will be installed correctly. Many of the Roofing Contractors on such Referral Lists / Websites and other Websites that Match Consumers with Contractors constantly make many mistakes, some major. We know because we have inspected many of their roofs for City/ County Building Departments. All Referral Lists / Websites, even ones from top Radio and TV personalities, should only be used as a source to obtain some names of companies that perform the type of work you are looking for. Just because they pay big money to be on the Referral List / Website does not mean they will do the work any better than those who are not on the Referral List / Website. This is because no one ever inspects their roof installations except for the standard local City/County Building Inspection, which in most cases is not very thorough. About the only time these websites might get involved is after a roofing problem has occurred. That usually is way too late. Don't fall for advertisements offering discounts like $500.00 off roof installations. How do you know they have not just raised their price that amount and have already figured it into their total price just to subtract it out again. Always get at least three proposals on any job. This presents quite a problem if all of the above are not very good ways to find a Good Qualified Roofing Contractor. We are often asked by property owners for the names of Roofing Contractors that we recommend, a referral list of the so called best Roofing Contractors. We simply do not refer any Roofing Contractors. Besides, all Roofing Contractors make mistakes. It does not matter how small or large, or how long they have been around, or what their reputation is - they all make mistakes and more frequently than you would think. The only way to greatly increase the chance of having a good quality roof installation is to use our Roof Inspection Service no matter who the selected Roofing Contractor is. Using any of the methods listed above is okay to start with to at least get the names of some Roofing Contractors, but we recommend going a step or two further to weed out the not so good Roofing Contractors and the ones that might not be the best fit for your roofing job. Start by checking the names of the Roofing Contractors that you have found to see if they are a member of one or more of the following Roofing Contractor Associations. See if they are involved and participate in the associations as a board or committee member. However don't use this as your only gauge. There also are Good Qualified Roofing Contractors that are not members of any association. Call Local Roofing Supply Companies and ask them questions about the Roofing Contractors you are interested in using. There really is no point in asking roofing contractors for references. Obviously, they will only give you the good ones. Instead, ask each of them to provide at least one, two is better, jobs where they are currently doing roofing work. Then we recommend you go by and watch and ask questions if need be. You will find out a lot more than you would from references. Then write a Request For Proposal (RFP). Properly writing the Request For Proposal (RFP) puts the Property Owner in control rather than the Roofing Contractor. we always include as part of the RFP our Qualifications/Requirements for Roofing Contractors. with the Roofing Contractor's proposal for their proposal to even be considered. Roofing Contractors are considered local if they currently hold a License or if they have held Licenses in the past for roofing in one or more Cities/Counties near your residence. A Building License for roofing may not be renewed in each City/County unless the Roofing Contractor has current work there or there is a potential for work. Using a Local Roofing Contractor is helpful to avoid some Storm Chasers who may not have the Consumers best interest in mind. hundreds maybe thousands of dollars, headaches, and possible litigation now and in the future. 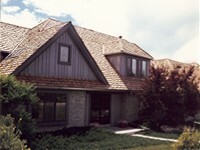 or represent any roofing materials or roofing contractors, so there is no conflict of interest.